Breaking: GOPers Blocking Trump's Foreign Aid Cuts and Protecting Migrant Caravan! President Trump has threatened to cut international aid funding from any country harboring and enabling the illegal alien caravan barreling towards the southern border. This isn't a humanitarian crisis... This is an invasion. Now, Congress is blocking President Trump from cutting the aid funding! Instead of securing the border, the GOP wants to increase international aid to Central and South America as part of their immigration package. They are trying to pull the rug out from President Trump! Send your instant FaxBlast to Congress and FORCE them to cut international aid to these countries and immediately vote to secure the border against these caravan invasions! Yesterday, President Trump expanded his threat to include all of Central America. If these countries continue to harbor and enable the illegal alien caravan barreling towards the southern border, Trump promised to cut all of their international aid. We are talking about billions of dollars in aid being cut. More than enough to build the wall. But your colleagues seem to disagree. GOP leadership phoned the President yesterday and ordered him to keep the funding intact. So not only are they refusing to secure the border, but now they are blocking the President from punishing the countries enabling this invasion. That is exactly what this is: an invasion. 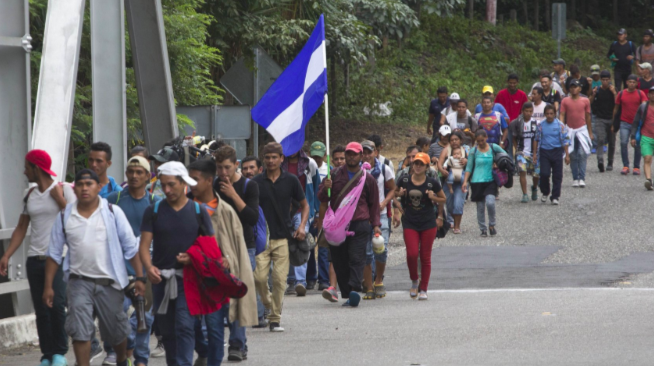 The caravan is marching through Central America and proudly waving the Honduras flag. They are supposed to be fleeing Honduras, but here they are celebrating it. It's more akin to a World Cup rally than a humanitarian crisis. Many in the GOP leadership want to include an international aid package in the immigration package that is being brought to the floor. The proposal is being introduced by Rep. Will Hurd. Instead of funding the border wall, they want to give away my tax dollars to the very countries that are sending us illegal immigrants. We've tried that already, countless times, and it doesn't work. Enough is enough. This is the campaign issue that I will be voting on. If you do not hold an immediate vote to secure the border and cut off aid to these countries, I will take action myself at the ballot box. Find your backbone. Secure the border and cut off the funding now! You need to get rid of the loopholes that migrants use to game the system to enter the US fraudulently. You need to give Border Patrol and ICE the funding and tools they need to track down illegal aliens who have disappeared into our society. You must cut the foreign aid to the countries that are giving these caravans safe passage. Yes, you must fully fund the wall. That is your mandate. That is what I am voting on. Honor your oath to protect this country, or pack your bags!